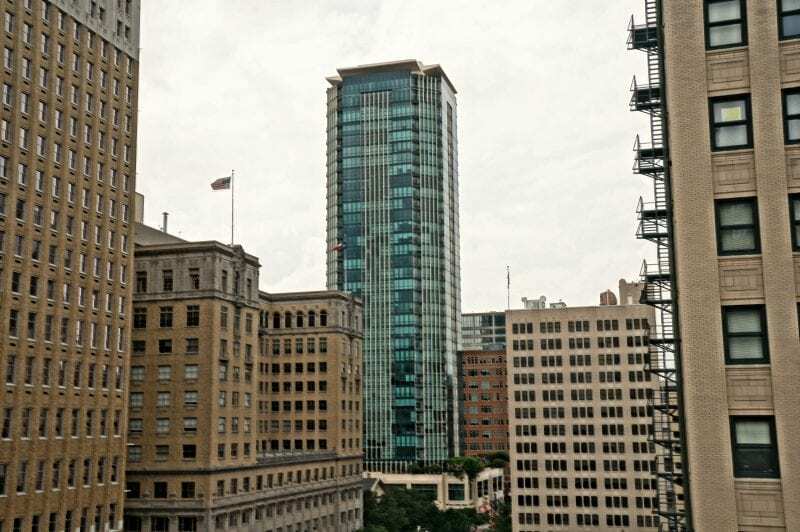 The Tower – Condos for sale in Downtown Fort Worth Texas. In 1974 The Fort Worth National Bank opened it’s 4th and final location in downtown Fort Worth. The modern glass building had a distinctive architectural style, featuring a flared base covering the 5-story atrium with natural light pouring in from every direction. On March 28, 2000 the building was heavily damaged when downtown Fort worth was hit by a powerful tornado. For over a year the building was clad in plywood and metal sheets while architects and engineers sought to salvage the building and then planned to demolish it. Asbestos removal proved to be cost prohibitive so work was halted and the future of the building was uncertain until a local developer announced plans to convert the building to apartments. What was originally planned as apartments finally came on the market as condos in 2005. There are 315 residential units in the building and the ground floor is occupied by office and retail on the street level. Floors 6-19 were planned to be apartments and are designated separately from floors 20-36 for that reason. Floors 6-19 differ slightly from the upper units. primarily in the level of the original finish-outs and the electric ranges, while 20-36 have upgraded finishes and the option for gas appliances. Naturally, the higher units have more commanding views of the skyline but many of the lower units have beautiful views looking directly into the city which has some attractive urban panoramic views.